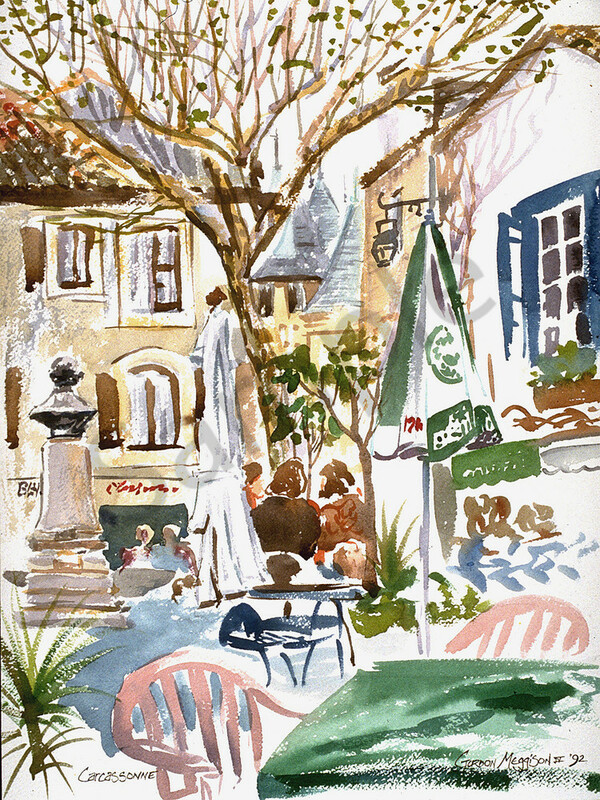 Carcassone Cafe is a 12" X 16" plein air watercolor on 140 lb. Arches cold pressed paper. The original long since sold, now only prints are available. ( I recommend printing on Fine Art Paper. See the "Wall Preview" option below to select your room type, size preference and wall color for a better view relative to the art). Carcassone Cafe was painted while I was on my way through southern France, and stopped at Carcassonne, a beautiful and extensive walled city that I had read about. It had withstood a famous siege for months and the people were starving. The queen of Carcassonne taunted the siege army general saying we have plenty of food, and threw out a cow, which demoralized the enemy troops , thinking they had much for food to be able to waste so much, and they left. In fact the people inside were starving, as were the enemy! Anyway I was drawn as I always am to great cafes in France, and painted this that chilly morn. It kept me loose! ( I recommend printing on Fine Art Paper. See the "Wall Preview" option below to select your room type, size preference and wall color for a better view relative to the art).